Love in the workplace: Howard Schultz says it's what the world needs more of. 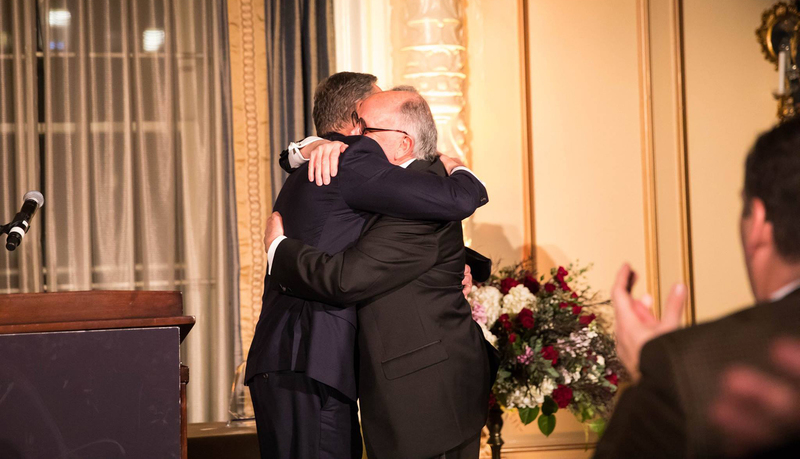 Howard Schultz and Howard Behar of Starbucks embrace on stage at the 2018 Seattle Business Magazine Executive Excellence Awards. This column appears in the April 2018 issue. The video is by Joshua Potter, shot at the 2018 Seattle Business Magazine Executive Excellence Awards. About seven years ago in this space, I wondered what it would be like if a big company operated according to principles of the Jesuit order, the scholarly religious congregation founded in the 16th century by Ignatius Loyola. Imagine my surprise recently when Howard Schultz — yes, that Howard Schultz — told a roomful of corporate honchos that love in the corporate setting is a powerful commodity. Calling Behar up to the stage, Schultz reiterated, “I love you, and I’m proud to say that.” The two men embraced and, safe to say, at least a few adults in the room experienced a little eye perspiration. Behar retired from Starbucks in 2009, having served as president of Starbucks North America and president of Starbucks International. It was on his watch that Starbucks went from a few dozen stores in the United States to a few dozen in most neighborhoods. Now 73, he seemed genuinely touched that Schultz would take the time to sit through a two-hour awards ceremony to say a few dozen words about him. Today, Behar is a busy author and speaker, eager to spread his gospel of servant leadership — of love, if you will — to anyone willing to read or listen. That credo is inspired by the work of Robert K. Greenleaf, who coined the term “servant leadership” in an essay published in 1970. But it’s an ancient school of thought that’s been traced as far back as the Chinese philosopher Lao-Tzu some 2,500 years ago. The Jesuits embrace servant leadership in a big way, which prompted my column seven years ago. I was attending classes at two Jesuit institutions and, immersed in the servant leadership ethos, started wondering, “What if …?” I was spurred on by reading a book titled Heroic Leadership by Chris Lowney, a former Jesuit seminarian who is a writer and speaker like Behar (and chairman of the board of stewardship trustees at Catholic Health Initiatives, the huge hospital system that includes CHI Franciscan Health in the Puget Sound region). This, as it happens, precisely constitutes Howard Behar’s legacy at Starbucks. That Howard Schultz appreciates it enough to say, “I love you, man,” speaks volumes about both men. And I just love it. John Levesque is the managing editor of Seattle Business magazine. Reach him at john.levesque@tigeroak.com.